About us — CHAYOU TEA. Tea Ceremonies. Tea Tasting. Tea Workshops. Tea Parties. CHAYOU means ‘tea friend’ in Mandarin and it is the idea of friendship through sharing tea that is central to all of our tea events. Our team comprises a group of tea experts and enthusiasts with one common aim - to inspire and educate people around the world about the joys of tea and tea culture. CHAYOU events are always entertaining, engaging and accessible to everyone. James is the founder of CHAYOU and our lead tea educator who spent his early twenties living in Japan before returning home to study Chinese Medicine. 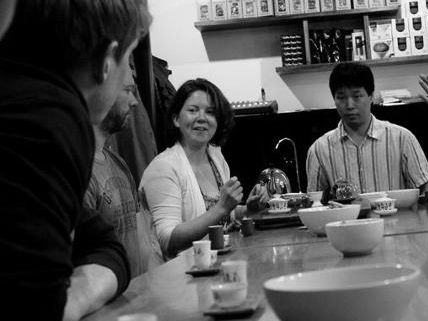 James's enthusiasm for tea led him to set up CHAYOU to share tea and tea culture with as many new 'tea friends' as possible. James runs all of our events in the UK. Ming Ming is a Chinese medicine and Qigong practitioner who studied the Art of Chinese Tea with a renowned teacher in Beijing. She has travelled extensively performing tea ceremonies and offering workshops, opening a door into the magical healing powers, sublime tastes and pure ‘Qi’ of some of the finest quality teas that China has to offer. Julie represents a new generation of tea specialist in China. She has studied tea for over 10 years. Julie is currently an International Business student at Coventry University completing a postgraduate project in tea and commerce. Her work aims to use business as a vehicle to share tea and traditional Chinese culture with the world. Stylist and buyer behind the ever developing Liscious Interiors. Born in Sheffield early 1960s. Now residing in Oxford with sculptor husband Walter and two gorgeous daughters. Having formerly worked in theatre and film Fran enjoys an element of drama and art in all the events which the Liscious team host. A warm welcome always awaits you in Fran's studio and shop in Summertown, Oxford. Sharing tea is a simple but significant act. When you invite someone to have a cup of tea it is an invitation to spend time together, to sit and listen, to chew over problems, make plans, forge friendships. Our tea events help people to do just that. Tea and conversation flows and before you know it strangers have become tea friends. Our tea farmers and tea suppliers in Asia. We know many of them personally. Some are innovators. Some traditionalists. Some are the right mix of passionate and crazy. All love tea and love sharing it with others. We only work with people who share our commitment to ethical, fair trade and environmental principles*. The tea we buy and serve can be expensive because it has not been farmed or processed with cheap labour or shoddy environmental practice. We are not an online tea shop or online tea supplier. We don’t want you to buy tea without tasting it. We want to teach you how to sample, buy and enjoy it yourself. This ensures that we remain 100% independent and allows us to serve you a wide range of teas that are of the highest quality and in perfect condition. We can, however, arrange for guests to have tea selections and teaware to take home after a CHAYOU event. * A sidenote on Organic Tea. Organic tea farming is becoming more widespread but it is a relatively new practice for farmers who previously were non-organic. Awarding of organic status is also not tightly regulated in India and China and the huge expense required to register as Organic is beyond the reach of many small tea farmers - many of whom farm organically but don't have the funds to get certified. Add to this that tea gardens take many years to mature (some of our teas come from 700 year old tea trees) this means that not all of the tea we serve is organic. We buy organic, and many of our tea events will serve certifiable organic teas, but at this point in time the rarest and highest quality teas that we serve are not organic as teas of that quality need time to mature.